Coffee has a long and illustrious history in the United States, dating a hundred years before the idea of coffee service or office coffee machines were even on the horizon. Such a lengthy history invariably means that the sainted jitter juice has gone through a handful of advances over the years. Each philosophical shift within the coffee industry was dubbed “a coffee wave.” At this point, we have gone through three official “Coffee Waves,” with a fourth currently under some debate. Undoubtedly, the keepers of the coffee flame will soon rule whether today’s advances can be considered a wave or merely technological innovations within the coffee sector. However, we are not here to debate the veracity of the fourth wave coffee but rather give some coffee wave history and tell everyone about JavaWorks’ third wave office coffee service for the Tampa and Orlando areas. So if you ever wondered what the heck the second wave of coffee was or just want to learn about the amazing coffee service products in Central Florida, read on. Coffee at the very beginning was extremely expensive. Therefore, it was reserved for the obscenely rich, kind of like salt in ancient Greece. However, in 1900 vacuum sealed packaging was invented and coffee was suddenly far more available, stocked in grocery stores around the country. Three years later Sori Kato, an adroit Japanese American, invented instant coffee. Prior to that coffee beans had to be laboriously ground before being brewed excruciatingly slowly. Even in 1903 people didn’t always have the patience for such a process. (You can’t blame social media for everything!) Thanks to the innovations of vacuum packaging and instant coffee, more and more Americans began drinking it. One last piece to the first wave of coffee was two well-known coffee brands: Maxwell House and Folgers. Thanks to these two companies, coffee shifted from an extravagance only for aristocrats to the every man’s or woman’s drink. The second wave of coffee wouldn’t occur for roughly another 70 years and was in direct response to how bad the first wave of coffee tasted. Second Wave: Now That’s Coffee! In this admittedly ridiculous scenario, the person driving the Mercedes was Peet’s Coffee and Tea along with Starbucks following not far behind. These two companies brought the second wave of coffee and made their names in the 1970 and 80s through slightly different paths. Peet’s focused on providing the highest quality of coffee and building a following of coffee lovers, who can be affectionately described as the first coffee snobs. Starbucks also promoted quality coffee but even more importantly, turned the coffee shop into a social experience and, eventually, a part of daily life. Today, many people spend hours in coffee shops. Before 1980 that was not the case. By 1990, Americans were hooked on quality coffee and would never return to the dregs of the wild wild west of coffee. In the coffee revolution timeline, we are in 2002. By then coffee was insanely popular and quality beans existed all over the country. Nevertheless, we are a country of tinkerers and innovative people with an incredibly popular product. 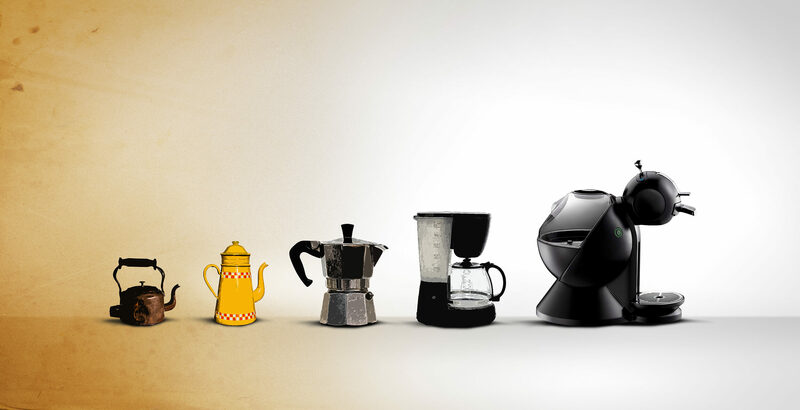 Through thousands of hours of experimentation the third wave of coffee was born. But it wasn’t as defined as the previous two. The third wave of coffee is essentially a mindset regarding the entire coffee process from agriculture to brewing techniques. The third wave of coffee is enthusiasts drilling down on the entire process, refining and improving every tiny detail. During this time, specialty coffee also grows in leaps and bounds and is often incorrectly assumed as the third wave of coffee. The fact of the matter is specialty coffee existed as far back as the 1970s. So it can’t be considered the third wave of coffee on its own. However, it is integral to the third coffee wave. The intense focus on improving the coffee process, the third wave, helped the specialty coffee boom. Therefore, specialty coffee is part of the third wave, without actually being it, if that makes any sense. Are you wondering if you’ve ever tried a third wave cup of joe? Don’t worry you aren’t the only one. Specialty coffee and third wave coffee can be hard to discern for the casual coffee drinker. There are also certain techniques which are unique to third wave coffee. If you are in South Florida, you are in luck as JavaWorks has brought third wave coffee direct to your office! Our selection of single origin coffee, combined with the latest and greatest brewing methods will have you wondering how you’ll ever go back to regular coffee service. Check out our website for more information on the life-changing coffee we offer!